Native American peoples are still here and still caring for their land. Can their conquerors say the same? is a curator at the American Museum of Natural History & teaches anthropology at Columbia and the City University of New York. His latest book is The Orayvi Split: a Hopi Transformation (2008). A few years ago, I was invited to attend a traditional Haida memorial ceremony. It was for a prominent community member in Old Masset on Haida Gwaii, off British Columbia. Before the potlatch, a friend casually mentioned a highly unusual event. When the man had died a few months earlier, a school of killer whales came into the harbour, right up close to the shoreline near his house. Killer whales were one of the deceased’s hereditary crests, passed down through the family matriline. On the Pacific Northwest coast, Haida families inherit rights of association with certain ‘totemic’ species by virtue of legendary events in which their respective ancestors were involved. Stories of one clan descending from a supernatural salmon or another emerging ancestrally from a cedar tree are typical. But such tales do not merely recount legendary events of the past: they shape how people interpret the present. So Raven, the central character of Haida mythology, brought light and fire (by theft) to the world, and enabled the original Haida to emerge from a clamshell. And today, many Haidas continue to interpret the actions of particular living ravens as communicating to them, signalling messages of value from which their human relatives might learn. I had already heard, and read, many similar accounts of Native relationships with the natural world and witnessed too many unusual events to be wholly sceptical about killer whales coming to pay their respects to a human relative. So I nodded politely, placed the information in a mental compartment not for literal or scientific scrutiny, and gave the matter no further thought at the time. At a key moment in the ceremony, a cedarwood box containing small amounts of traditional food (salmon, kelp, etc) is placed on a log fire to consume its material form, while the essence, transformed into smoke, carries upwards. In the ceremony I attended after hearing about the visit of the killer whales, the charred box fell perfectly into four neat sections, cleanly releasing the man’s spirit heavenwards. At that moment, I glanced up, and noticed two bald eagles alighting in a nearby pine tree. They remained there, apparently attending to the events below. Haidas noticed this too, though they gave no overt indication until one of the ministers added a prayer to her litany, thanking the Creator for sending them. Bald eagles, it turned out, were another of the deceased’s hereditary crests. As an anthropologist, I am a scientist, and profess the standard commitment to search for objective truth via observation and reason; I cheerfully accept established scientific laws. Yet this commitment has often been challenged by my experiences among Native communities involving the natural world, which I am unable to explain by scientific reason. I have come to believe that such experiences point towards a different, genuinely sustainable relationship with nature. But taking account of them means listening much more carefully to other people’s world views than we have done to date. As the world starts to feel the effects of burgeoning human populations, declining biodiversity, climate warming, sea-level rise, and severe weather events, humanity seems helpless. Our global economy is geared to endless growth, and the in-tandem consumption of resources and production of unmanageable waste. Well-meaning initiatives multiply with each passing day, but typically founder against the unthinkable prospect that we might actually change fundamental aspects of our behaviour. Of course, our cumulative ‘Western’ knowledge, our science, indeed our technology, has produced many wonderful things, not least modern medicine. But the current organisation of our global economy, and its obsession with endless — often trivial — innovation keeps us stuck on a path that might easily lead to the demise of both our species and its habitat. Can we do no better? After 200,000 years of Homo sapiens, and less than two centuries of living in industrial states geared to exponential technological innovation, must we just shrug in the face of the inevitable? Have another martini and watch our own sunset? Or are there other models from which we might learn? I am a social anthropologist, British by birth, American by naturalisation. Since the late 1970s, I have spent a fair amount of time residing in and visiting Native communities throughout the US and Canada. Most of my resident fieldwork has been with the Hopi of Arizona, but I have also worked with some of the New Mexico Pueblos, the Hoopa of northern California, the Puget Salish of Washington State, the Cayuga and Mohawk of upstate New York, the Haida, Kwakwaka’wakw and other peoples of British Columbia, and the Choctaw and Chickasaw of Mississippi and Oklahoma. As a Briton, I grew up with the idea (shared by many in Americans too) that American Indians had been assimilated, died off or, in all events, lost their traditional culture long ago. My undergraduate education in anthropology at the University of Cambridge in the early 1970s did nothing to correct this mistaken idea. North American Indian studies were almost entirely absent from my course of study, and none of my teachers had any experience of Native North American societies. Indeed, they tended to be disdainful of the very idea: Native Americans were somehow second-class indigenes, mentioned only in connection with ethnographic reconstructions of times long gone. As far as research went, Native American societies were either no longer extant or wholly acculturated and not suitable for anthropological study. I began to realise how inapt this conception was when I entered graduate school at the University of New Mexico. I went on some initial trips to the Rio Grande Pueblos led by Alfonso Ortiz, a Pueblo anthropologist. I learnt not only that Pueblo peoples were still fluent in their languages (six in all — Tewa, Tiwa, Towa, Keresan, Zuni and Hopi; except for the first three, all completely unrelated to each other), but also that they remained deeply attached to age-old ritual practices and to their subsistence economy. More than anything else, they were jealously protective of their autonomy from the dominant society. As my experiences expanded, I have been continually astonished at the degree of cultural persistence across Native America. Wandering, with a Hoopa guide, on traditional lands of the Karuk and Yurok in northern California, I ran across preparations for the First Salmon ceremony, and a community life strongly grounded in their aboriginal heritage and the annual World Renewal cycle. On the Akwesasne Mohawk reservation on the US-Canadian border, even after 350 years of intensive colonisation (including, in 1710, a visit to London of ‘the four Mohawk kings’ to meet Queen Anne, and, in the mid-1700s, fighting for Sir William Johnson in the Seven Years’ War), despite continuous missionisation since the 1640s, despite relocation and land appropriation, the St Regis Mohawks still conduct business in the Mohawk language. Some Coast Salish people of the Puget Sound still use traditional beliefs in guardian spirits, who are encountered at power spots in their environment, to guide their actions. Where Native Americans have lost their languages, as for most of the Haida, Hoopa, Chickasaw, or Puget Salish, there remains a palpable sense of continuity with the deep past, especially in the persistent value placed upon the land, its life-forms, and its sustaining force. A striking example of this can be found in Native service in the US military. Native Americans have the highest per‑capita participation in the military of any ethnic group in the US. While the Navajo code‑talkers of the Second World War are well-known, they were preceded in this by Choctaw code-talkers in the First World War, and accompanied in the Second World War by code-talkers from other tribes, including Hopi, Comanche, Cherokee, Lakota, and Meskwaki. Long before this, in the 18th century, the Six Nations of the Iroquois, having formed an alliance with the British, split in their allegiances to Loyalists and Patriots in the Revolutionary War, with many fighting on both sides. Native Americans fought in large numbers in the War of 1812, in the Civil War, and every major foreign engagement over the past two centuries. In view of the generally awful treatment they have received at the hands of successive US governments, it seems surprising that so many should continue to enlist. I asked a decorated Hopi Second World War veteran — a man proud of his military service and at the same time strongly committed to Hopi autonomy — about this apparent paradox. He said that Native American patriotism has some different dimensions from that of non-Native compatriots. He pointed out that Natives, as the only class of Americans who are genuinely non-immigrants, fight to defend the land itself, a land for which their ancestors fought and died over countless generations. This sense of the land has outlasted all the treaties (and their breaches), all its disposition by private cession and government pre-emption, and all its formal alienation to non‑Native hands. Hopis, for example, continue to look to their aboriginal land Hopitutskwa (roughly, the northeastern quarter of Arizona) as both the meaningful landscape of their ritual practices and as their defining territory, even though they have formal control of only a small portion of that (the Hopi Reservation), with the great majority controlled by the federal government and private owners. Native enlistment in military service has a deeper-rooted and more encompassing reality than conventional loyalty to the modern nation-state — it is a commitment to the land and all its life-forms. Of course, many Native Americans are patriotic in the standard sense as well. Learning from this way of being in the world will require serious attention to Native perspectives: not just as a prop for some Western-conceived environmentalism that marshals the same old metaphysics in new bottles, but with a goal of refiguring the culture-nature, mind-body split that dominates much of Western thought. Such splits tend to reduce nature, including the human body, to physical forms and processes. According to this world-view, only human beings have minds. Nature is thus deprived of intrinsic sentience or conscious intentions: without those, or with only a token acknowledgement of their existence — such as a concern for animal suffering in animal rights ­— there can be no genuine ethics in human relations with other species. And upon our dualist metaphysics is built a whole scheme of global practices — political, economic, medical, even religious — that, notwithstanding its benefits, is the underlying cause of the present global environmental crisis. This is why I believe that refiguring our world-view is a prerequisite to solving, or at least ameliorating that crisis. The Haida have undergone extensive change since smallpox severely diminished their population and colonial authorities imposed harsh measures of assimilation in the late 19th century. Notoriously the ‘Residential’ schools were designed to detach children from their own culture and language, and from the 1890s to the 1950s the Canadian government outlawed the potlatch ceremony, jailing people for participating in practices that decidedly transgressed against the protestant ethic and the accumulation of surplus. In the 20th century only a few elders continued to speak the language, and with the Canadian government’s suppression of the potlatch, traditional practices ebbed away. Since the 1970s, however, there has been a cultural renaissance in Haida arts, the potlatch has resumed, and totem-pole carving has flourished. Many people continue to collect subsistence foods — berries, greens, tender pine cones, salmon, clams, etc — expressing age-old habits of relationship, and acknowledging their fundamental dependence on the natural environment of Haida Gwaii (‘islands of the Haida people’). The acknowledgement is not just theoretical: it is saturated with the sense of mutual sentience and engagement: matter-of-fact reports of respectful killer whales and solicitous bald eagles are very much part of everyday life. Some 2,000 miles south of the Haida rainforests and fishing cultures of British Columbia, the Hopi of Arizona’s high desert would have no trouble recognising these beliefs. Hopis are dry-farmers in a land without rivers or streams, and they depend on meagre annual precipitation to raise their principal crops of maize, beans, and squash. Many Hopis still farm subsistence crops, speak their language (although it is under threat), and continue to practise a religion — and a science — that is fundamentally attuned to environmental processes. The ritual enactment of Katsina spirits epitomises this. Katsinas represent myriad forces of the natural world, ancestral deities, moral principles, and historical events. During the Katsina season (roughly January to July), the spirits still come each year from their homes in the mountains to dwell around the villages. With human individuals as their spiritual vehicles, they manifest themselves in dance performances in the kivas (ritual chambers) and plazas of the dozen Hopi villages. Katsinas also make themselves manifest as clouds rising from the mountaintops, bringing life-giving rain to nourish all life-forms in Hopi country. Hopitutskwa, Hopi land, is a living, breathing landscape. Tuuwaqatsi, the natural world, or specifically its life forms, populates this landscape. Hopis continue to sing to, celebrate, and propitiate both the landscape and its life forms — the stage and its play. Just like the Haida, Hopis, who depend on the natural world for their spiritual and physical subsistence, look directly to it for guidance. For example, when a woman gathers plants for food or crafts, she typically returns to the places her mothers have been going for generations. More than once, I have heard a woman say that she feels directed by the plants themselves; sometimes, the plants want her to leave them for another time, and go to gather their more vigorous relatives in another patch. Plants, too, are sentient in this world-view, and have supernatural capacities beyond their intrinsic chemical properties. Some are regarded as particularly effective at drawing down clouds. Hopis have always sung to their plants. The Hopi year is arranged calendrically; seasonal phenomena are anticipated and ensured by ritual practices. For example, in the cold of Powamuy (the purification month of February), Hopis conduct Powamu, the ‘Bean Dance’, planting beans in containers in the kivas, where a hot fire (nowadays in a pot-belly stove) germinates them quickly. On the day of the dance, Katsinas (here meaning the personated spirits) emerge from the kivas to distribute the bean sprouts among village households where they are added to harukwivi (bean-sprout stew) for a feast. The whole sets out in miniature the desired progress of the agricultural season: planting in April, carefully nurturing the crops until the first fruits at Niman (the Home Dance in July), and thereafter gathering and celebrating the harvest. The Powamuy ceremony is both a prayer for the agricultural cycle and a ritual prefiguring of it. In the ceremony, Hopis express their wish that the season will be successful, recognise their critical dependence on natural forces larger than themselves, and acknowledge that unless they proceed with care and commitment, acting ethically in relation to nature as well as to each other, things could well go wrong. When things do go wrong — a drought, or excessive rainfall that washes away the fields, or a plague of grasshoppers — Hopis typically blame their own failings: they question whether their ‘hearts’ were truly right, whether they have acted thoughtfully, whether their intentions were pure. Their whole relationship with the natural world is shot through with the same ethical structure in which they frame their relationship with fellow human beings. This does not mean that individual (or collective) actions always follow those ideals: people get jealous, betray each other, become angry, plot against each other, and so on. In this regard, Hopis are no different from the rest of humanity. But their ideals, norms, morals, and virtues — most graphically on display in ritual performances — point to mutual responsibility, and to collective effort for peace and harmony, in both the natural and the social world. There can be no harmonious society if the balance of nature has not been maintained — by the deliberate exercise of human attentions. 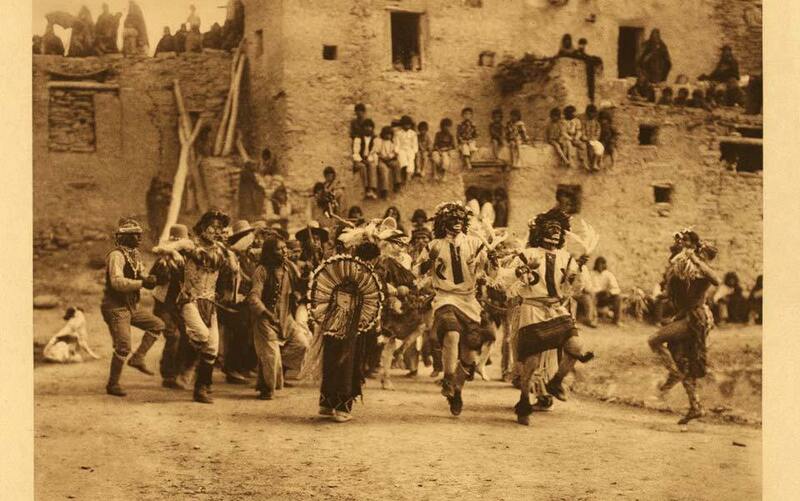 I first attended the Hopi Snake Dance in 1978. It was a powerful example of this deliberate strategy to shape natural events through forms of ritual attention. The ceremony (no longer open to outsiders) features the Snake Society dancing with live rattlesnakes and bullsnakes held in their mouths: they dance in a solemn swaying motion, before releasing the snakes into the desert to carry their prayers to the natural forces, especially the sources of rain. In Hopi thought, snakes are especially associated with water, and are the guardians of springs. Lightning and rain are explicitly associated with snakes and their movements. That first year, I staked out my spot in the dusty plaza at dawn, waiting all day through the August heat until the late afternoon ceremony. I was transfixed, not least by the palpable seriousness of the protagonists: this was not some tourist spectacle but a profoundly thought-out ritual engagement, an age-old practice that seemed to go back to the dawn of time. Sure enough, within half an hour of the dance’s ending, rain began to fall, though there had not been a cloud in the sky all day. Since then, I have seen the Snake Dance on three other occasions: each time rain began falling within a short period after the dance concluded. Under such circumstances, it felt that my scientific world-view, which identifies weather events solely as meteorological phenomena, needed as much defending as Hopi ‘magical’ beliefs in the ritual power of their snake ceremony. Like the Haida, the Hopi people have experienced much change over the past century. Many younger Hopis no longer understand the language, nor practise subsistence farming, and the communities experience problems typical of the rural West in general and Indian reservations in particular: widespread unemployment, health concerns including a high incidence of diabetes, alcoholism and substance abuse, and poverty. But, again like the Haida, some of the strength of Hopi traditions derives from the fact that they continue to live where they always have, unlike large numbers of American Indians who were forcibly removed from their aboriginal lands by government actions. Hopis know that their traditional lifestyle is tough: Màasaw, the earth deity who greeted them upon emergence from the world below, agreed to accept them only if they were prepared to live his hard, simple way of life. While many Hopis are poor and live in what the federal government defines as substandard housing, the older houses are ones they built themselves with sandstone, clay, and logs, and their owners are not indebted to banks or mortgage companies. For a long time, some villages refused to accept water or electricity lines, disliking the spiderweb-like intrusion into the earth (where Muy’ingwu, the germination deity, has his dwelling), and foreseeing also that this would indebt them to non-local companies, and compromise their independence. In recent years, to gain access to electricity, some Hopis have installed solar panels, which neither interfere with the earth nor are controlled by utility companies. Amid all the changes over the past century, a core feature of Hopi belief is the animacy of the natural world, and the sentience of all its inhabitants. These beliefs underlie a sense of interdependence that is occasionally reflected in actions and events that Western thought treats as impossible. Hopis continue to celebrate and value this world-view, and identify the environmental breakdowns of the world at large as the result of their fellow humans’ failure to follow a similar path. In his book The World Until Yesterday (2012), Jared Diamond calls our attention to the virtues of pre-industrial society — small-scale village-based communities, a household mode of production, a basis in economic and environmental balance rather than continual growth. This is good. But even Diamond perpetuates a pattern of the West as projecting its own imagined antithesis onto ‘Other’ peoples. This is a pattern that goes back at least to the discovery of America. If we like ourselves and celebrate our culture’s virtues, then Others — savages, primitives, barbarians — shore up that self-confidence. If, on the other hand, we feel badly about the damaging effects and disadvantages of our civilisation, then Others — children of nature — are held up as its virtuous alternative. Either way, we seem capable of looking only via our own mirror, and do not pay enough attention to what other peoples in other places actually say and do. Ever since Christopher Columbus made his transatlantic voyages from Spain in the 15th century, American Indians have been Europe’s archetypal Others: noble or ignoble savages, primitives in a State of Nature (sans roi, sans foi, sans loi). ‘In the beginning,’ as John Locke’s Second Treatise of Civil Government (1689) had it, ‘all the World was America’ — supposedly deprived of custom, culture, morals, any kind of ratiocination (even though in 1520 the Mexica city of Tenochtitlan had a larger population than London and many similar features, including state institutions, commerce, industry, arts, and architecture). For Locke, European civilisation was humankind’s apogee, thus the inhabitants of the New World could only be its nadir. By contrast, in the 18th century, Jean-Jacques Rousseau, one of civilisation’s discontents, believed that the American Indians were the epitome of the natural man, a noble Arcadian counterpoint to European decadence. These two opposing views might have since evolved, but they continue to dominate mainstream ideas about Native American culture, whether in film, art, politics, or literature. American Indians continue to be portrayed as either ecologically noble savages in harmony with their environment — or, as wanton savages, governed by uncontrolled instinct rather than analytical thought. For the first centuries of colonialism, American Indians were seen as ignoble wasters of the natural estate, which was only truly cultivated and improved by European rationality and technology. Even now, Indian ancestors have been portrayed in recent decades as recklessly destroying American megafauna by rampant overhunting at the end of the Ice Age. As we have seen, the potlatch ceremony on the NorthwestCoast is often invoked as an instance of such economic irrationality, since it includes massive giveaways of goods and sometimes their dramatic destruction. Contemporary politico-legal arguments against Native American sovereignty echo these old stereotypes, especially the childlike dependence of Native nations on the nation-state. They are used to justify Native exclusion from environmental and wildlife management decisions. In 2002, a ski resort at the sacred mountain Nuvatukya’ovi (‘snow piled on top place’, or the San Francisco Peaks) proposed a plan to use treated human effluent to generate extra snow. This deeply disturbed the Hopi and several other Native Southwestern peoples, who brought a lawsuit against the National Forest in 2004. For Hopis, snow — like clouds — is a manifest form of Katsina spirits: it is hard to imagine a practice more out of tune with their sacred valuing of the natural environment than recycling human waste to produce artificial snow solely for recreation. Although the pipeline was built, the Hopi lawsuit has gone back and forth, and after a lot of effort, most recently seems to have come out in favour of Native interests. For a very long time, however, the Snowbowl company and the local municipality argued that Indians had no rights over land-management decisions (even on federal and not just on state or local lands). Before 1924, Native Americans were not citizens, but ‘wards of the state’, treated as dependants, with many restrictions on their freedom including the right to travel outside reservations. But the degree of Native autonomy has fluctuated throughout the history of colonial occupation. Prior to the Revolutionary War of 1775-83, the Six Nations of the Iroquois (among others) had exercised a substantial degree of political and territorial independence. Only after the War of Independence did the new US nation announce to their erstwhile foes in that war — the Seneca, the Mohawk, the Cayuga, and the Onondaga (the Oneida and Tuscarora generally sided with the Americans) — that they were now to be considered conquered nations who had lost the autonomy guaranteed by pre-war treaties. In formal speeches by US representatives, members of the Native American Confederacy ceased to be ‘Brothers’ and became ‘Children’. Attempts in recent decades by Native nations to re‑assert independence — for example, in the Mohawk confrontations with the governments of Quebec and Canada at Kanesatake and Kahnawake in the 1990s — have graphically demonstrated the continuing power of the nation state. Recently, however, with legislative moves towards indigenous self-determination in both the US and Canada, Native groups have begun to enjoy some limited sovereignty over their lands and their lives. The management of natural resources remains a major point of contention, with Native voices typically heard only after government or private interests. Anthropologists such as Paul Nadasdy of Cornell University, who works with the Kluane First Nation of the southwest Yukon, even argue that what is now referred to as ‘TEK’ (traditional ecological knowledge) is so incompatible with governmentally imposed bureaucracies of land management that there is little possibility for genuinely mutual collaboration. On Haida Gwaii, much of the old-growth forest, a primary basis for the total ecosystem on which Haidas depend, has been recklessly logged off in recent years by Weyerhauser, a multinational logging company whose website loudly proclaims its interest in ‘sustainable’ use of forest products. It is not just the usual suspects of big government and big multinational companies who are excluding Native voices and the benefit of centuries of Native experience in managing resources in these particular environments, however. Environmentalists ought to be open to forming more alliances with Native communities, but they have often sought to dominate the debate with ideas about the natural world which derive ultimately from the same metaphysics and the same structures of power driving their corporate opponents. Environmentalists view the natural world within conceptions deriving from Western cosmology – whether deriving from a scientific or a religious perspective. Fundamentally, humanity is conceived not as part of nature but outside it; nature is to be observed, imagined, manipulated, or aestheticised, but it is not a participatory player in the human condition itself. We must preserve, protect, nurture, etc: all transitive verbs depicting we (Western) self-conscious human subjects as the sole agentive player in the relationship; the natural world is thus equally objectified, albeit with different outcomes, by both a solicitous or an exploitative approach deriving from Western cosmology. Unless they sign onto an environmentalism that is recognisable within that cosmological framework, Native stakeholders may be useful subordinate allies in the environmentalist movement but not with a genuinely equal voice at the table. Greenpeace’s opposition to Makah subsistence whaling off the coast of Washington — on the apparent grounds that they have superior wisdom about this charismatic species — is one example. Some environmentalists do take account of traditional ecological knowledge, but much more could be learnt if Native thinkers were accorded genuine decision-making powers in such arrangements. There have been some encouraging attempts, such as the success of the Hoopa Valley Tribal Council’s forestry management programme in northern California. Concerned over the typically unsustainable practices of the logging industry, the tribe took over forestry services for its lands from the Bureau of Indian Affairs in 1988, and has since received numerous awards for sustainable land use, including being selected for the US mission to the United Nations Commission on Sustainable Development in 1995. The tribe’s forestry department has been extensively involved in watershed restoration. Its tree nursery provides seedlings to replant areas where trees are logged, as well as distributing seedlings to other Native and non-Native communities in northern California. Elsewhere in the US, several tribal entities have partnered actively with the National Wildlife Federation to protect bighorn sheep (the Nez Perce in Idaho), restore wild bison to tribal lands (the Assiniboine in Montana), and preserve the environmental corridor along the lower Colorado River (the Cocopah in Arizona). Similarly, in southwestern Canada just north of Vancouver, the Tsleil-Waututh Nation has recently achieved significant results in watershed restoration, including the enhancement of salmon habitat, by entering into co-operative agreements with the British Columbia provincial government to co-manage regional resources and forestry operations. Even so, there is still widespread resistance to Native participation in the management of those lands currently under state or federal government control (such as National Parks, Forests, or lands administered by the Bureau of Land Management). Although treaties negotiated in the 19th century often reserved continuing fishing and hunting privileges to tribes in ceded ‘public’ lands, in practice these rights have often been denied. Conflicts over fishing rights in Washington State and northern California, the subject of extensive litigation and long-term protest by Tribal members, are a case in point. Yet there are no good reasons to justify these oppositions and exclusions, and plenty of evidence to suggest that traditional Native practices are more economically rational and ecologically insightful than most corporate or governmental practice. When Native practices have been upheld, then government land management has benefited, too. The Hoopa Valley Tribe long lamented that the US Forest Service prohibited them from annually burning forest underbrush to encourage the new shoots that attract game (a pervasive practice throughout aboriginal North America). The ban on such burning under the old federal policy of fire suppression had only led to a worsening of wildfires. In 1995, however, the US Forest Service adopted the Hoopa practice as part of its fire management strategies, and the ‘cultural burn programme’ has since proved effective in limiting damage caused by wildfires. Both corporate and government scientific bureaucracies tend to see environmental management as a rational practice that should be driven by the needs of commerce and leisure. Attributing sentience to natural forces and elements, and promoting an ethic of mutual dependence and respect are not part of the plan. To move beyond stereotypes and to see what might genuinely be gained from Native perspectives, we must develop the capacity to listen, converse, and more carefully observe. Such anthropological attending, for want of a better term, also requires more critical self-scrutiny, so that we do not revert, in yet another dimension, to the more psychologically comfortable but illusory practice of simply projecting our own ideals and anxieties. If we attend more closely, we might gain a much more sustainable and mutually respectful relationship with the natural world and its many species — a genuine inter-species comity. For that to happen, we must be open to the unexpected — including the regard of eagles, the agency of rattlesnakes, and the sympathy of killer whales. And it is time to set aside nation-state prejudices and the exclusion of Native peoples from a voice in the management of environmental relations. We will all be better off if that voice is allowed genuine authority to help shape decisions affecting our world.